We are members of the Victorian Canine Association. 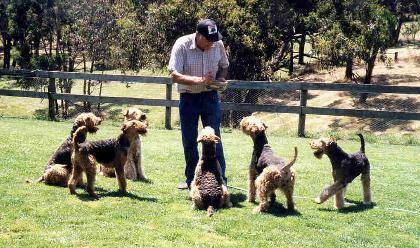 Lyn is actively involved in many dog clubs and is currently the Secretary of the Airedale Club of Victoria, the Treasurer of the Central Gippsland Kennel Club, and Vice President of the Morwell-Traralgon Kennel Club. Lyn can be regularly found on a weekend exhibiting her terriers (with much success) in the show ring. Colin enjoys regularly spending time camping and bushwalking with the Airedales and Welshies. These terriers certainly love the outdoors! Our dogs soak up the luxury of living indoors at night, and regularly enjoy the adventures into the bush at our property in country Victoria.